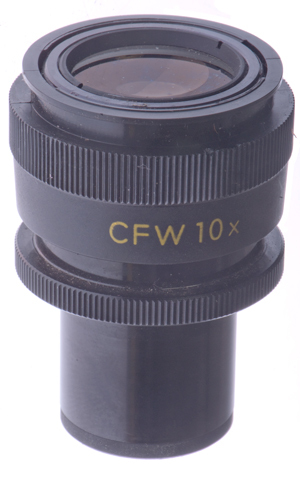 Ive just received a Nikon CFW 10x eyepiece which is supposedly high eyepoint. It is also a focusing eyepiece. It was suggested that you can get away with not focusing it by setting the diopter to 0. However, I'm not sure which ring is for diopter adjustment (there are two manual rotating rings.) The ring that is closest to the eye is considerably thicker. Also, I don't see any numbers on either of the rings so not sure how I could set the diopter to 0. You can find the "0" in several ways. - On a properly set-up microscope, find the eyepiece position in which all objectives are parfocal (from low to high magnification, e.g. 4-40). To do this, use the objective 40 to focus (stage) on an object, then go back to the 4 and focus the eyepiece until the object is in focus again. Go back to the 40, focus using the stage again, go back to 4 and focus with eyepiece again. All objectives should now be parfocal and the eyepiece should be in 0 position. Thankyou for those instructions. As previously mentioned, there are two rings on the eyepiece. Which would be the focusing ring - the one closest to the eye or the one further away? Not sure what you mean. The lower ring might possibly be part of the lower eyepiece tube. It might come off eventually. Well since it's a focusing eyepiece, I assume it would have a focus ring, just like a photographic / camera lens. I can't visualise any other way to focus the eyepiece other than rotating a ring. Ah, I see. I was wondering why you had two focussing rings. I assume what you mean is: which of the two curdled rings is the focussing ring? The one on top. It moves the entire upper part of the eyepiece as you can see in my first link. Thanks again for clarifying. When I find the "0" position, I'll duct tape it in place.